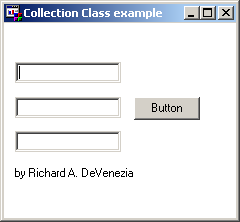 The Collection Class is a data container for collecting and holding items of any type, including numbers, character strings, lists, or objects. So _apply() does the same thing to each thing in the collection. This can come in handy. An action class is any class that implements a method named Action. SAVECLASS this entry to create the Soldier class. SAVECLASS this entry to create the Salute action class. COMPILE and TESTAF this entry to see _apply do its stuff. Consider a much more practical Collection, a group of widgets in a frame. 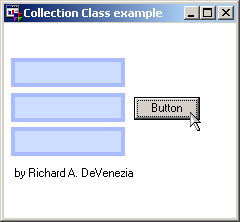 A simple such collection is one of Text Entry Controls. You want them to all have the same appearance, but want to experiment with styles or themes at run-time. You might develop (or resuse SAS') dialogs for specifying various aspects of widgets which could then be applied to a collection of widgets. SAVECLASS this entry to create the Dispatch action class. Lots of interesting things are going on. The action method returns the input object after doing something with it. The something in turn is specified by the methods named method and value which return a self reference. Thus when either method() or value() are invoked as the input parameter to _apply() the stage is set for the 'blackbox' iteration _apply does to the items in the collection. Since self is returned, the same objects action() will be run. Additionally, method() can handle any number of and type of arguments since it uses the rest= option of the method statement. A nice tight scheme, no? This page was last updated 23 March 2004. Even though I compile at Explorer, I could not save class. Since class attributes are not updated, our application crashes. How could I compile SCL and save class?